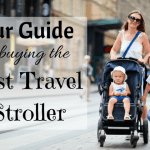 One of the many headaches for travelling parents is whether to take their own car seat along or not. In fact one of the many reasons that we don’t hire cars much when we travel is exactly for this reason. Carrying around two car seats would just be crazy. Travel days would be a nightmare and storage on the road is a problem. We would rather catch buses everywhere than deal with that. Another alternative is to hire car seats at our destination. 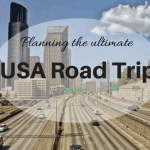 This is what we did in the USA on our Deep South road trip. However, it was expensive, the seats did not seem to be of high quality and we did not know their history, like whether they had been involved in any accidents. 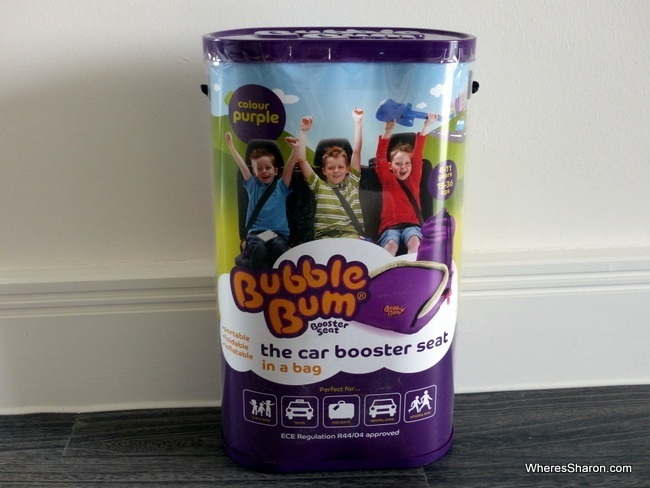 We are so happy that we have found another alternative – a BubbleBum booster seat! This inflatable car seat is a fabulous option for 4+ year olds. It meets safety and legal obligations in many parts of the world (like the USA, UK and Europe) and does not take up much space at all in luggage. It is a perfect match for families like ours that want to travel light. We looked forward to trying one out on our road trips in England. I must admit that as cool as it sounded, I wondered if an inflatable booster car seat could really work out. Below you will find out BubbleBum booster review. Click here to see the latest prices in Amazon. 1.4 Who should use a BubbleBum booster seat? Our BubbleBum car seat is a big hit. It is everything promised in the promotional material – compact, safe and easy to use. The first thing I noticed about the BubbleBum inflatable car booster seat is how it folds up small when not in use. When we received it, it was rolled up in a small bag. I cannot imagine that any other car seat could be so compact. It is also easy to deflate the seat after use and put it back in this bag. It is also very lightweight. 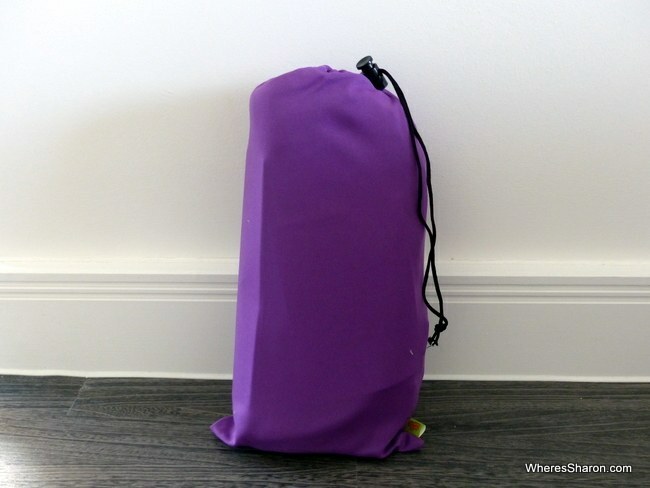 This bag then easily fits in our day pack, backpack or the kids’ trunkis when we do not need it. 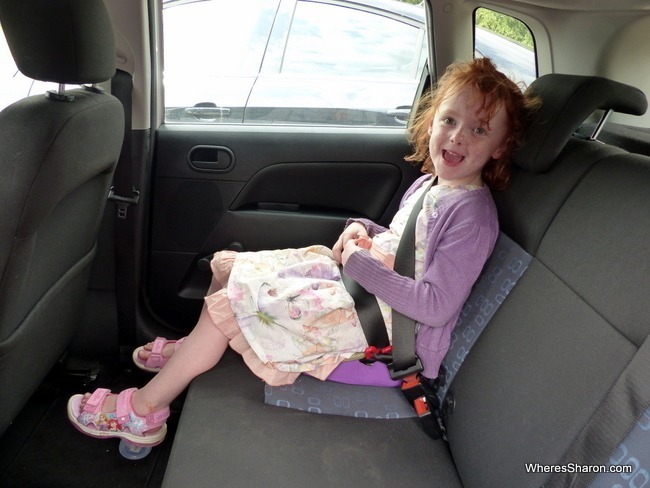 Most car seats I have used have been fiddly and annoying to install – not the BubbleBum car booster seat. It’s simply a matter of inflating (quick and easy), putting on the car seat and adjusting the strap for the back so that the red hook is the right height for your child. S is nearly tall enough to not need this latter step. Once the child is sitting, you will need to thread the seat belt through this red hook at the back and the two on this seat. We found our BubbleBum inflatable booster seat useful for other situations as well. Mr 3 has been using it in restaurants and also in places we have been staying so that he can sit at a table more comfortably to draw. Who should use a BubbleBum booster seat? These seats are designed for 4+ year olds that weight 40-100 pounds. They can only be used with a 3 point harness – that is a seat belt that goes across the lap and diagonally across the chest. If you have multiple kids that need a booster seat then the small size of the BubbleBum car seats make them perfect – you should have no problem fitting three across. For my Australian readers, I have to point out that unfortunately, we cannot use BubbleBums in Australia. However as we have demonstrated, they are still a great option for us to take with us when we travel internationally. We are big fans of the BubbleBum booster car seat! As people who like to travel light, it is just perfect for us. It is simple to use, compact and complies with all safety and legal obligations. What’s not to love? Our only concern was that initially Miss 5 said that she felt like she was slipping off, but she is used to big booster seats with side wings. Five minutes later she was fine though. 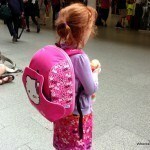 She loved the purple colour (it also comes in black) and the little purple bag that comes with it. We are not the only ones to like this seat. BubbleBum booster seat reviews in Amazon are consistently high in the UK and in the USA. 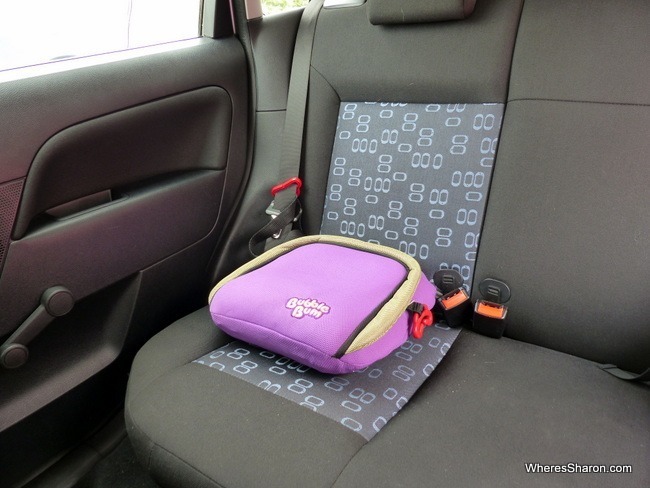 If you are looking for an easy, compact option to avoid carrying around big car seats and high rental fees next time you travel then I recommend taking a BubbleBum booster car seat. You can also read more car seat and booster seat reviews here and our Trunki Boostapak review here. 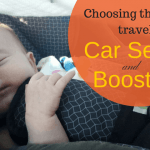 Do you travel with car seats? Any tips? BubbleBum gave us this product in exchange for an honest review. Where’s Sharon is a participant in the Amazon Services LLC Associates Program, an affiliate advertising program designed to provide a means for sites to earn advertising fees by advertising and linking to amazon.com and its partners. Amazon and the Amazon logo are trademarks of Amazon.com, Inc. or its affiliates. 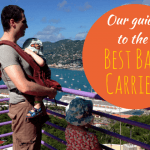 Thank you for supporting my site and helping me make it the best family travel resource on the internet! Hi I’m from Australia and going to the west coast of the USA (San Fran,la vegas and hawaii) can this booster seat be used there and are taxi’s ok with you using it? Hi Nicole! Yes it’s definitely ok for the US. We used two of them there on our last trip. I can’t imagine taxis having a problem. In California, you have to use car seats in taxis so this is a much quicker to install option than others anyway.